You should feel horrible for missing Gabriel Orozco’s latest show at Marian Goodman. His elegant, biomorphic sculptural shapes are recognizable at first as found objects: bones, husks, driftwood. In the rear gallery, though, less finished “sketches” of polyurethane foam extruding through fine wire mesh point to Orozco’s material process. Gradually, it dawns on you that the artist didn’t find the previous shapes; he created them by manipulating quick-drying foam on sheets of latex with a hard-to-fathom series of gestures and pauses. What looked so familiar becomes perplexing and unknown. At least it did until Saturday. Then, if you go to Feigen for the Joseph Cornell show, and then buy Robert Lehrman’s unprecedented, awesome-looking catalog/DVD-ROM tour of the boxes, you’ll be just fine. If not their effectiveness. One more picture of Olafur Eliasson’s The Weather Project at the Tate in London. As you’ll never see it again… As B.Logman’s photos and news reports indicate, The Tate Modern has a massive-crowd-pleasing phenomenon on their hands. Now suddenly this photo I took at the preview seems worth posting, if only because who knows if it’ll ever happen again. Hiroshi Sugimoto: I came for the Seascapes, I stayed for the Hall of Thirty-Three Bays. 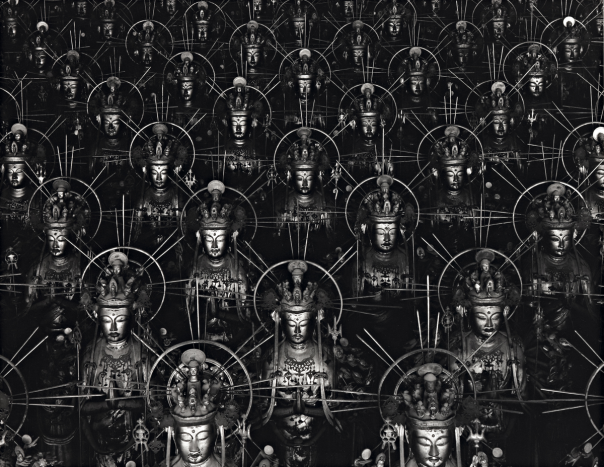 I love Sea of Buddhas, 1995, his series of nearly identical photos of the Sanjusangendo, shrine in Kyoto. They’re generally under-appreciated, partly because they work best when seen all together. Fortunately, Chicago has started making up for the Cow Parade embarrassment by putting the whole series of Sea of Buddha on view at the Smart Gallery at the University of Chicago until Jan. 4th. 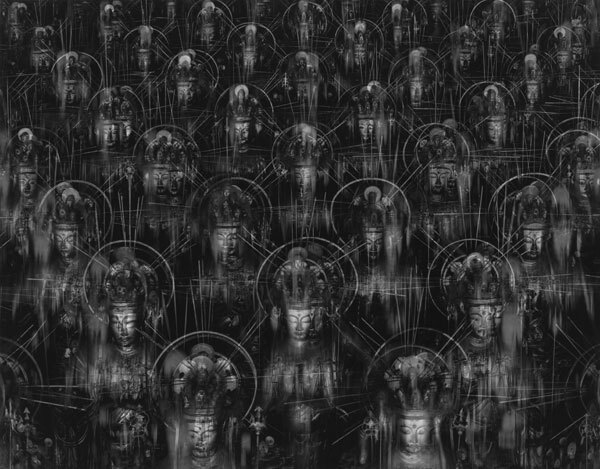 Also on view, the artist’s rarely seen video, Accelerated Buddha, which rocks like only an increasingly shimmering animation of nearly identical still photos with a sharp electronic soundtrack by Ken Ikeda can. WJ. How and when did you first take up working with photography? HS. When I was six or seven years old, the science teacher at my elementary school taught us to make photographs with light sensitive blue paper. By placing an object on this paper under direct light we could transfer its shape to the paper’s surface. This activity made a strong impression, not only on the paper, but on my mind. As I think about it now, it was as if I had started at the very moment of the invention of photography as if I was reliving the experiences of photographers like Niepce, Daguerre and Fox Talbot. WJ. You have lived in the United States for most of your career. How has this shaped the development of your approach to photography? HS. Wherever I lived, art was the only activity that interested me. But both the move to a new country and the fact that photography is a relatively young medium seemed to welcome new attitudes. However, while living in a new country, I started to deal in ancient Japanese art and consequently was involved with continuity and tradition. I think my work is the product of both of these influences. WJ. What does it mean for you to have a show in the Sainsbury Centre with its rich collections of world art? HS. The Sainsbury Centre has a collection of several works of ancient Japanese art that were acquired from me while I was still a dealer, and I feel that this exhibition of my own work brings these two parts of my life and activities together. I think it is very good to see one’s work together with ancient art. Looking back gives a sense of perspective you cannot get when looking at works of your contemporaries. WJ. Often there is a sense of stillness in your work, as if time were somehow frozen. Indeed, time is one of the features more evident in your work, and in the past you have even used very long exposures in a time lapse. Could you tell me about your thoughts on time in your work in general? HS. Time is one of the most abstract concepts human beings have created. No other animals have a sense of time, only humans have a sense of time. But time is not absolute; the time measured by watches is one kind of time, but it is not the only kind. The awareness of time can be found in ancient human consciousness, arising from the memory of death. Early humans buried their loved ones and left marks at the grave site, trying to remember images of the dead. Now, photography also remembers the past. I am tracing this beginning of time, when humans began to name things and remember. In my Seascape series, you may see this concept. WJ. Your work has taken both natural and highly artificial subjects as a point of departure (Seascapes and Dioramas). Where would you situate yourself in relation to artifice, on the one hand, and nature on the other? HS. The natural history dioramas attracted me both because of their artificiality and because they seemed so real. These displays attempt to show what nature is like, but in fact they are almost totally man-made. On the other hand, when I look at nature I see the artificiality behind it. Even though the seascape is the least changed part of nature, population and the resulting pollution have made nature into something artificial. WJ. Do you manipulate the image? 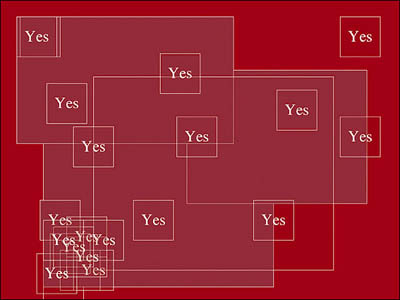 In what way does your work interrogate the process of looking? HS. Before we start talking about manipulation, we have to confirm the way we see. Is there any solid, original image of the world to manipulate from? Each individual has manipulated vision. Fish see things the way fish see, insects see things the way insects see. The way man sees things has already been manipulated. We see things the way we want to see. Of course I manipulate. 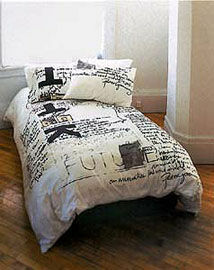 Artists create excitement by manipulating a boring world. All art is manipulation, to take still photography with black and white images is further manipulation, but before all this the very first manipulation is seeing. WJ. You work in series and in this respect your work parallels the approach of movements like Minimalism or even Pop Art. Could you tell me why you have adopted a serial approach and how you see your photography in relation to other forms of contemporary art? HS. I see the serial approach in my work as part of a tradition, both oriental and occidental – Hokusai’s views as well as Cézanne’s landscapes or Monet’s Haystacks, Cathedrals and Waterlilies. WJ. Do you see time as an important component in the Hall of Thirty-Three Bays series? HS. Time is an important component of all of my work. In my videotape Accelerated Buddha, time takes on an accelerated shape. WJ. Your earlier series devoted to the Dioramas, Seascapes and Theatres depict subjects which are not recognizably Japanese, while the Hall of Thirty-Three Bays is based on one of the most important shrines in Japan. Could you tell me why you chose this series to work on over the last six years and how it relates to your other work? HS. All of my works are related conceptually. The photographs of the Hall of Thirty-Three Bays extend the concept behind the Seascape series: repetition with subtle differences. Even though these images seem similar to those of the Wax Figures, I see them more as a ‘Sea of Buddhas’. WJ. In what way does the series have a connection with Buddhist thought? HS. I don’t think that this series has more of a connection with Buddhist thought than any of my others. It interested me, however, that I was photographing this temple, built as a result of the fear of a millennium 2000 years after the birth of Buddha, at a time when we ourselves are approaching a millennium 2000 years after the death of Christ. WJ. You said you made each of the photographs from this series at the same hour of the morning. Could you say why and explain a little about your working method? HS. The photographs were all taken between 6.00 and 7.30am so that the natural light would be soft and diffused, also so that each image would be photographed in the same light. Working at this hour also allowed me to be alone in the Temple since the monks are not around until 7.30am. Each subject calls for different working hours. Only the Seascapes allow me to work 24 hours non-stop. WJ. The Hall of Thirty-Three Bays depicts a sacred subject. Do you see your work as in any way engaged with the sacred? HS. The relationship between the Buddha series and religious thought is somehow parallel to the one between the Seascapes and nature. Pollution has made nature artificial and the commercialization of traditional religions has de-spiritualized them. Them’s fightin’ words. In his Cinema Militans Lecture, Greenaway thought he’d rile up his audience at the Netherlands Film Festival with his opening, “Cinema died on the 31st September 1983.” (Killed by Mr. Remote Control, in the den, if you must know.) But it’s his claim that Viola’d trump Scorsese that’s the real “they bought yellowcake in Niger” of this speech. He’s just got Britishvision, distracted like a fish by a shiny object passing in front of him [Viola‘s up at the National Gallery right now.] And the conveniently timely evidence he cites seems, well, let’s just say we know from conveniently timed evidence over here. Greenaway argues for a filmic revolution: throw off the “four tyrannies” of the text, the actor, the frame and the camera, banishing at last the “illustrated text” we’ve been suffering through for 108 years, and replacing it with true cinema. The Guardian‘s Alex Cox sees video games and dvd’s rising up to answer Greenaway’s call, and he makes the fight local, pitting Greenaway against the British Film Establishment, as embodied by director Alan Parker. So the choice is either Prospero’s Books or The Life of David Gale?? This fight’s neither pretty nor fair. More than rallying the troops, Greenaway and Nokia are actually tottering to catch up with the next generation. Paul Thomas Anderson’s inclusion of Jeremy Blake’s animated abstractions in Punch Drunk Love. The Matrix Reloaded‘s all-CG bullet time “camera.” The Matrix launching the DVD player, for that matter. Gus van Sant’s Gerry as film-as-video-game and the multiple POV reprises of scenes in Elephant. Multi-screen master Isaac Julien, Matthew Barney, spawn of Mario Brothers. And the unscripted cinematic narrative mutations of corporate-sponsored mediums like PowerPoint and AIM buddy icons. The top one’s shot in the mirrored ceiling. I’m working on it, but right now, I got nothing that’ll top this. the british public treats it as the real sun, laying out on their backs as if at the beach. Just got back from the preview and party for The Weather Project, Olafur Eliasson’s absolutely breathtaking installation at the Tate Modern in London. The Turbine Hall is something like 500 feet long, the full length and height of the building. I can tell you that Olafur created a giant sun out of yellow sodium streetlamps, but that doesn’t begin to describe the experience of seeing it and being in the space. It is this awareness of one’s own perception which is at the heart of his work. Not only does he use and transform this unwieldy cavern, he intensifies the viewer’s sight and sense of being in the space. And as always, Olafur lays bare the mechanisms that create the unavoidably sublime experience, which in this case include, literally, smoke and mirrors. You can see exactly how you’re being manipulated affected, and you’re fine with it. At least I am. 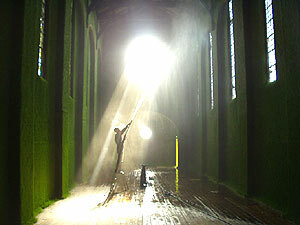 The artists Heather Ackroyd and Dan Harvey and their team of 15 people plastered the walls of a church in South London with clay and grass seed. Read their diary at the Guardian and watch it grow to Graeme Miller’s soundtrack. Last week, I stopped by a party to celebrate the first issue of Artforum under its new editor, Tim Griffin, who I’ve known and admired for years, ever since he was edited the late Artbyte with ICA Philadelphia’s Bennett Simpson. (For some of their collaboration that stayed online, check out the great show they curated at Apex Art in 1999, too). How can I be sure? Well, Tim started by putting a photo by my boy, Roe Ethridge, on the cover. Roe’s work rocks; I’m a huge fan, even though, in the headshot he did for my Souvenir press kit, I don’t look anything like Beck, Andrew W.K., or Fischerspooner. [via Modern Art Notes] Nice, too brief info about Gabriel Orozco on the site for PBS’ Art:21 series. Tyler said the program segment was “a little too languid,” which sounds just about perfect for Orozco’s work. The New Yorker entranceth and the New Yorker pisseth one off. The latter came last July, via critic Peter Schjeldahl’s flaccid reading of Orozco’s clay pieces at Documenta. Art:21 has images of a beautiful follow-up show at Chantal Crousel’s gallery in Paris, and I’m still happily entranced, staring at an earlier terra cotta piece sitting on the shelf next to me. As a PowerPoint geek, exploring the software’s implications is, like fresh breath, a priority in my life. [Cf. PowerPoint as a Creative Medium, which has additional ppt examples and articles.] A couple of months ago, Byrne gave a few of us a tour of his gallery show at Pace McGill, where they pre-released his hypnotic PowerPoint book/DVD, E.E.E.I. (Envisioning Emotional Epistemological Information). Good stuff. And before you leave the Times‘ place, why not look over my article on video art bootlegging. [via ArtForum] An interesting article in the Financial Times on the conservation challenges posed by ephemeral art, especially color photography and video. C-Prints, by far the most popular format for contemporary art photography, have a very uncertain future. Video and film, in the mean time, require a transfer plan, making sure the medium and format stays current (and the work stays true to the artist’s intent). The article doesn’t quite get it sometimes, though. Advocating for collectors to receive certificates? It’s a dopey collector who doesn’t get them already. And the last quote by Tony Oursler feels a bit too off-hand. Of an old video work he recently remastered for exhibition this fall, he says,”It looks better now than then.” That’s great, but that means that how it looked then is now lost. AXA’s Ad Reinhardt Research Project, which focuses on the conservation of contemporary painting (and Reinhardt’s work in particular). Of course, I found out about it one day too late, but it turns out the selling of Marclay’s 1995 work, Telephones, perfectly encapsulates the challenges video poses to artists and dealers. But several people who bought the unsigned edition apparently felt no compunction in copying it for friends. Without the signature, these dubs were essentially identical to the unsigned tapes. The result [with no offense to the Fab Five]: it queered the market for the larger edition. Infinite reproduction is, theoretically, at least, inherent in video-based art. But in Marclay’s case, the talismanic, even fetishistic, signature was enough to make some buyers think twice before dubbing. But it’s a little finger-in-the-dike, though, as the unsigned, now-unlimited edition proves. I’ll give Marclay a call about this some time. [via WoosterCollective] Banksy, a prominent London street artist, has moved his work into a gallery for the weekend, and some people are pissed (in the American, not British, English sense of the word). Banksy tagged some live barnyard animals, and an animal rights protestor chained herself to the pen, temporarily leaving the foxes of England defenseless. Meanwhile, in the US, when artist Nathan Banks painted words on the sides of cows and transcribed the poems they produced as they wandered the fields, no one raised an eyebrow.